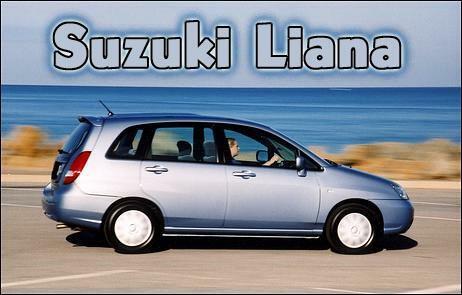 Let's get straight into it - if we were in the market for a $20,000-ish 5-door hatch, would we buy a Suzuki Liana? The Liana isn't a bad car, but it's hard-pressed to challenge the Pulsar hatch, Rio, 323/Laser, La Vita and the variety of other hatches on the market. To successfully compete head-to-head with these vehicles, the Liana needs to be exceptional in absolutely all areas. Certainly, the Liana has some things going for it - most importantly, at only $19,990 (plus ORCs), it scrapes in as the cheapest hatch in its class. It also offers excellent interior space and some attractive onboard features. One of the key attention-getters is the Liana's digital instrument display. 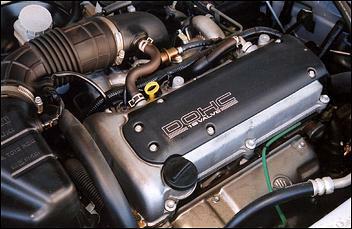 Road speed is indicated numerically, while engine rpm, fuel level and coolant temp are shown on bar graphs. There are also dual trip meters in addition to the everyday odometer. The digital display is slightly cluttered and can be flared by direct sunlight, but - overall - it works reasonably well. It's better than some of the digital displays we've sampled in other cars. A standard CD/tuner (made by Clarion) comes wired to four speakers. The system sounds fine at normal listening levels, but pump up the bass and increase the volume and things get quite distorted. Oh, and - like the instrument cluster - the head unit's display is also affected by direct sunlight. Other standard features on the Liana include power windows and mirrors, remote central locking, variable intermittent front wipers, intermittent rear wiper/washer, lights-off reminder, dual vanity mirrors, front map lights, remote fuel filler release, three cup holders and a storage tray under the front passenger's seat. The standard air conditioning system pumps out an impressive amount of cold air. Heading rearward, the Liana maintains a high level of passenger comfort. The rear seat features an adjustable angle backrest and, like in the front, you'll find a generous amount of headroom. Rear legroom is also very good. Officially, the Liana is listed as a 5-seater, but there's no way we'd like to be one of the three people crushed into the rear. Instead, think of the Liana as a very comfortable adult 4-seater hatch; fold the centre rear armrest down and relax. Stick your drink in the armrest's cup holder too, if you like. Despite offering plenty of rear occupant space, the Liana doesn't sacrifice its rear cargo area. Behind the back seat is a large cargo floor boasting easy access. The hatch is supported by twin struts and lifts high enough so that you won't hit your head. It's easy to pull down again too, thanks to the twin grab handles. 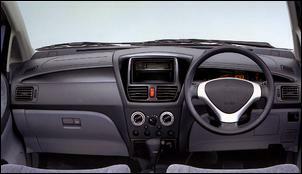 Hiding under the carpeted floor is a full-size spare wheel; you can conceal your cargo under the parcel shelf. When the need arises to cram a whole lot of cargo into the Liana, its split fold-forward rear seat arrangement can accommodate. To fold both parts of the split backrest forward, you must first tilt the left and right sections of the bottom cushion so they sit vertical on their leading edge. This is done using pull-tabs poking out between the base of the backrest and the bottom cushion. Next - after you've slid out the two head restraints - you can and fold both parts of the backrest forward; the enlarged cargo floor isn't flat, but it's volume is impressive. The Liana's 1140kg kerb weight is propelled by a barely adequate engine; an all-alloy MA16 1.6-litre four with DOHC, 16-valves and multi-point injection. 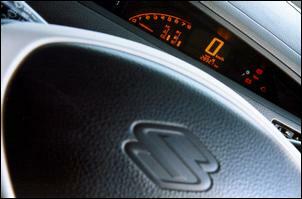 With up to 76kW at 5500 rpm and 144Nm at 4000 rpm, the Suzuki is an uninspiring performer at the best of times. Load the vehicle with people and luggage and it's a struggler. Torque comes on-stream at about 3500 rpm, but don't bother approaching the 6500 redline - there's not much performance to be found up there. A standard 5-speed manual gearbox is offered and overall it performs well. It is, however, quite clunky when cold and it whines after a dose of wide-open throttle. Note that an optional 4-speed automatic transmission is available, bringing the Liana's total price up to $21,890. The saving grace of the lacklustre 1.6-litre engine is that it returns relatively good fuel economy - we averaged around 7.7 litres per 100km during our test. Another bonus is the touring range provided by the relatively large 50-litre fuel tank. Suzuki lists the Liana to run on regular unleaded fuel, but - with its 9.7:1 compression ratio - on occasions it can be heard to detonate. Other than its lack of urge, the new Suzi feels average on the road. Poised on a MacPherson strut at each corner, ride quality is okay, but large sharp bumps cause some discomfort inside the cabin. The chassis feels composed and stable, though gusting crosswinds do upset its straightline tracking. Being front-wheel-drive, the Liana is a cornering understeerer; its independent rear-end is well tied down and unlikely to ever get out of control. Road holding from the standard-fitment 185/65 14 Bridgestone B391s (mounted on steel rims) is adequate, but there's more than normal tyre noise. There's also a reasonable amount of body wind noise to go with it. The Liana's power assisted rack-and-pinion steering is pretty well sorted - it's got a very direct feel and just the right amount of effort. Braking performance was acceptable during our test, but - again - load the Liana with weight and it'd be marginal. From a technical point of view, the brakes are quite disappointing - drum rears and no ABS. 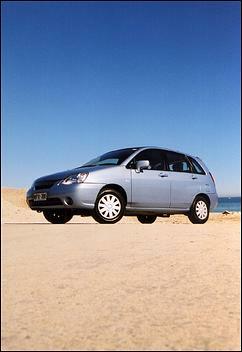 For the most part we agree the Liana looks chic - it's not quite a hatch, not quite a van and not quite a station wagon. At least it's something different. External features include colour-coded bumpers, door handles and mirrors, sweptback halogen headlights, a bee-sting aerial and a rear spoiler with LED brake light. 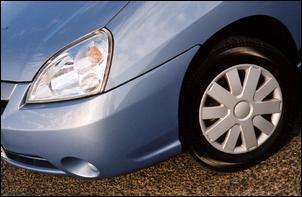 Plastic hubcaps come standard, though alloy wheels can be fitted at extra cost. Structurally, the Liana's body quite rigid. Like all new cars sold in Australia, the Liana also comes with side-intrusion beams, childproof rear door locks and crumple zones. Extra safety comes from standard dual airbags, 3-point pre-tensioned front seatbelts with force limiters, adjustable B-pillar anchorages and four adjustable-height head restraints. We also like the large exterior mirrors and the generous all-round vision. Note, however, the rear head restraints are large and dramatically impair rear three-quarter visibility - they're best removed whenever there are no rear passengers. 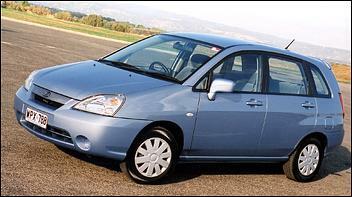 Something buyers won't be able to identify by flicking through the Suzuki brochure is the car's relatively cheap feel. 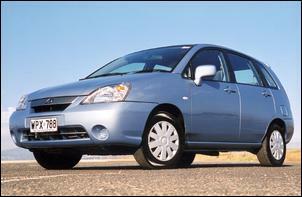 Yes, the Liana is a cheap car - but it sure has that feeling to go with it. Having identified these cheap-bits, we have to say that panel fit and paint quality looks fine and - on our test car - everything worked as it should. Long term, we'd expect the Liana to be quite durable - Suzuki is confident enough to back it with a 3 year/100,000km warranty. Note that service intervals are set at every 15,000km - longer than the distance used by most of the competition. So here is a $19,990 5-door hatch with up-to-date styling, low running costs, plenty of interior space and a reasonably attractive standard features list. 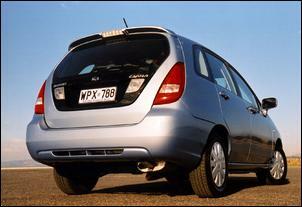 Regardless of its features, however, the Liana has a cut-price feel to it and is merely average to drive. We'd gladly hand over those 500 extra dollars. The Liana 5-door hatch was provided to AutoSpeed courtesy of Suzuki Australia.